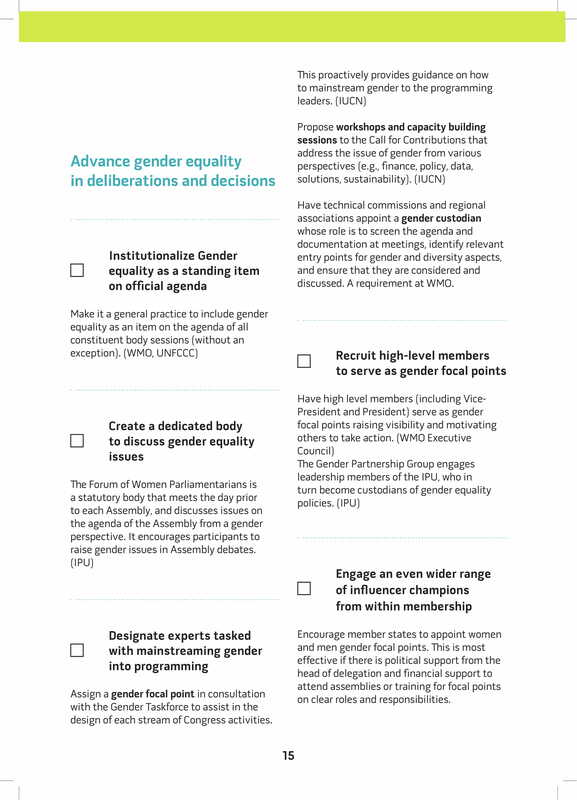 The Gender-Responsive Assemblies Toolkit, launched by the IGC-Representation Impact Group at the UN General Assembly 28 September 2018, is grounded in the fact that international decision-making forums are still largely male-dominated, despite the gender equality objectives they have set. Strong commitments have been made under Agenda 2030 for Sustainable Development, in conventions such as CEDAW, in the Beijing Platform for Action and in the Women, Peace and Security resolutions of the Security Council. 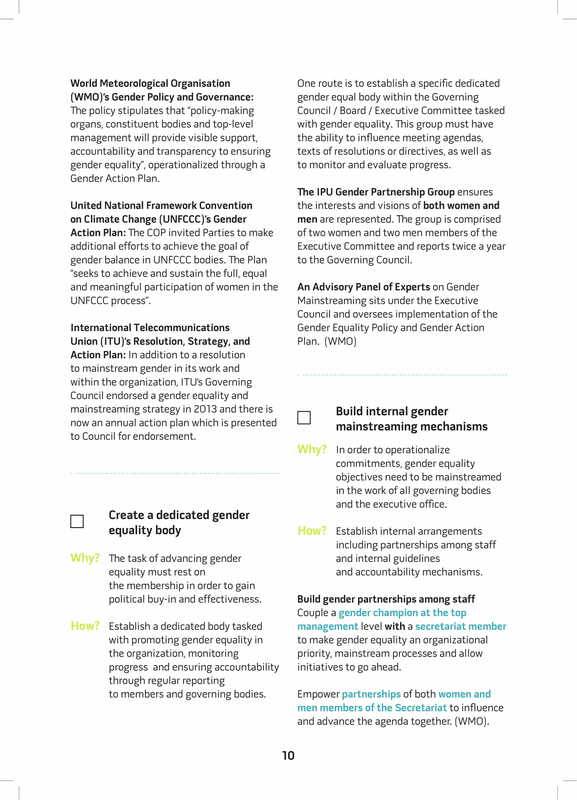 These instruments call for action and establish mechanisms for monitoring progress at the national level. 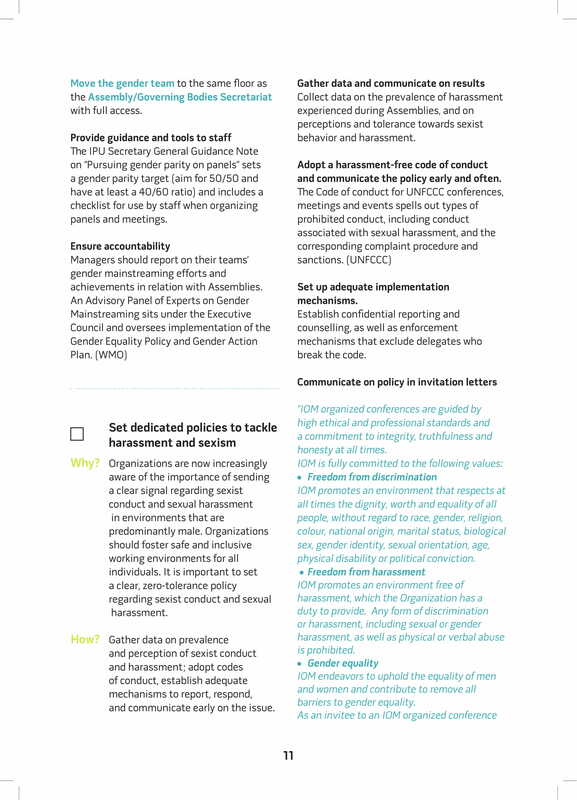 Sadly, international decision-making processes still lack similar standards and accountability mechanisms to ensure that women's voices are heard and have equal influence. 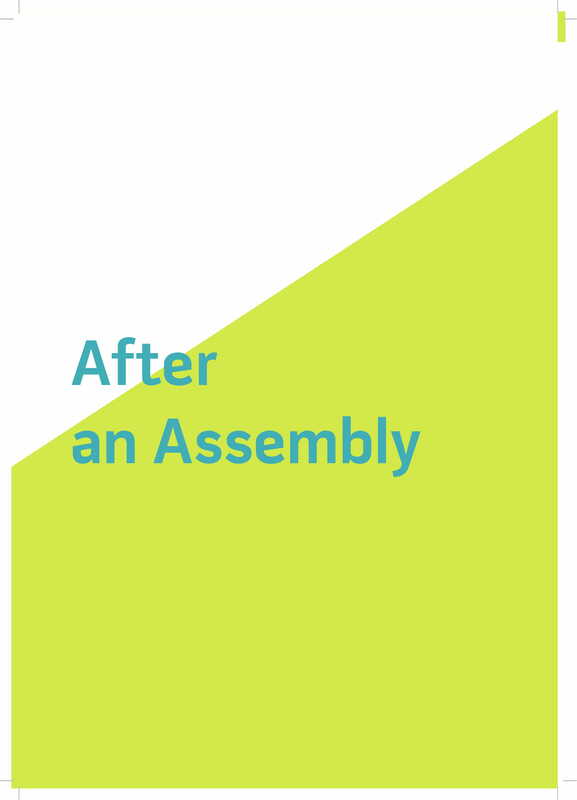 The Gender-Responsive Assemblies Toolkit is a powerful and practical 'How To'. 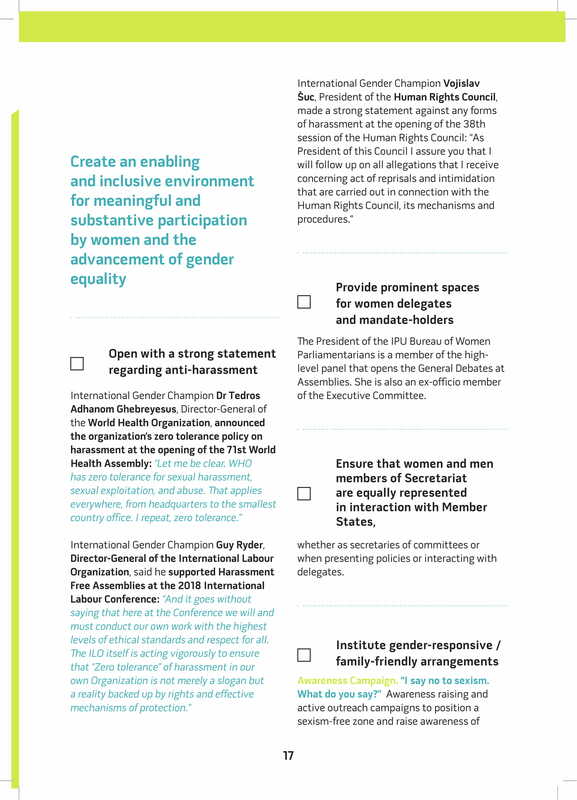 It provides direction for all actors that can drive change, including Directors-/Secretaries-General, Member States, Civil Society and Secretariats. It is written by the International Gender Champions Representation Impact Group members and contains practical tools that can be applied before, during and after an Assembly. 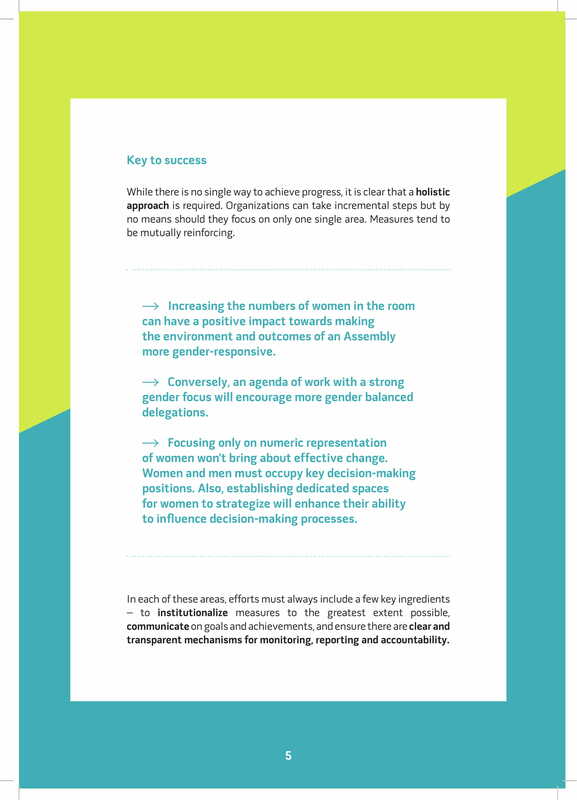 The Toolkit highlights actual good practices and lessons learned to help achieve immediate, consistentand measurable progress on the road to parity. 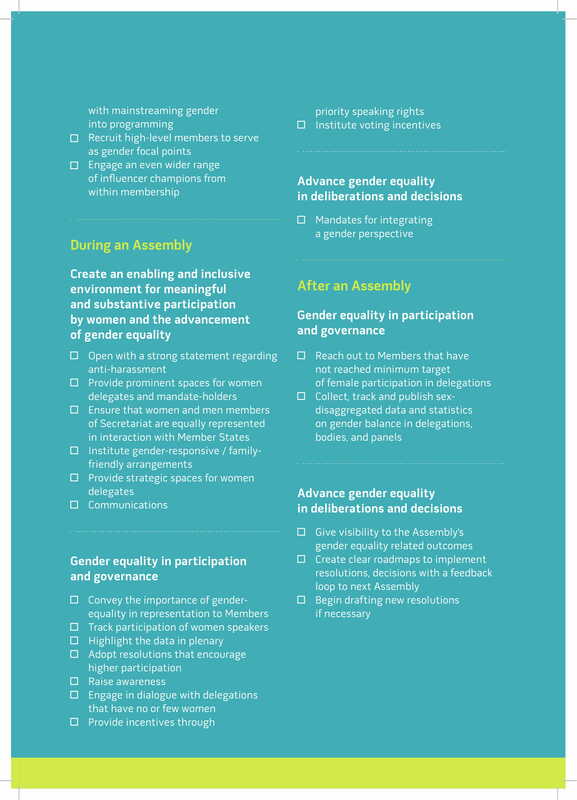 The Gender-Responsive Assemblies Toolkit presents an agenda for concrete action. 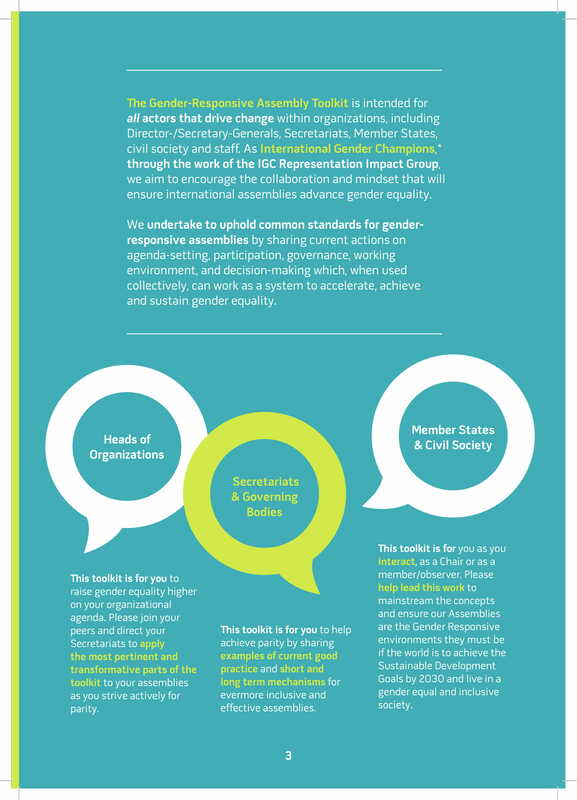 The IGC Representation Impact Group seeks to galvanize the international community to advance women's representation and influence in international fora, from the frontline to the main offices of power. IGC Representation Impact Group members contributing to the Toolkit co-chaired by the Inter-Parliamentary Union (IPU), Sweden and Women@theTable are the International Labour Oganization (ILO), International Organization for Migration (IOM), International Standards Organization (ISO), International Telecommunication Union (ITU), International Union for Conservation of Nature (IUCN), Office of the High Commissioner for Human Rights (OHCHR), UNAIDS, United Nations Office at Geneva (UNOG), World Health Organization (WHO), World Intellectual Property Organization (WIPO), World Meteorological Organization (WMO), United Nations Conference on Trade and Development (UNCTAD) and United Nations Framework Convention on Climate Change (UNFCCC), in addition to support by UN Women. 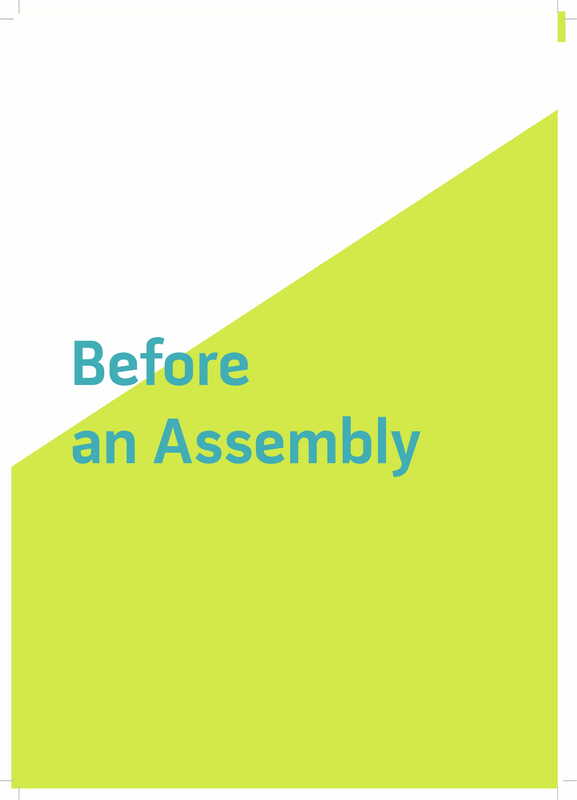 Download toolkit here or continue reading below to learn how some organizations prepare Before, During and After Assemblies to make their convenings more gender-responsive. 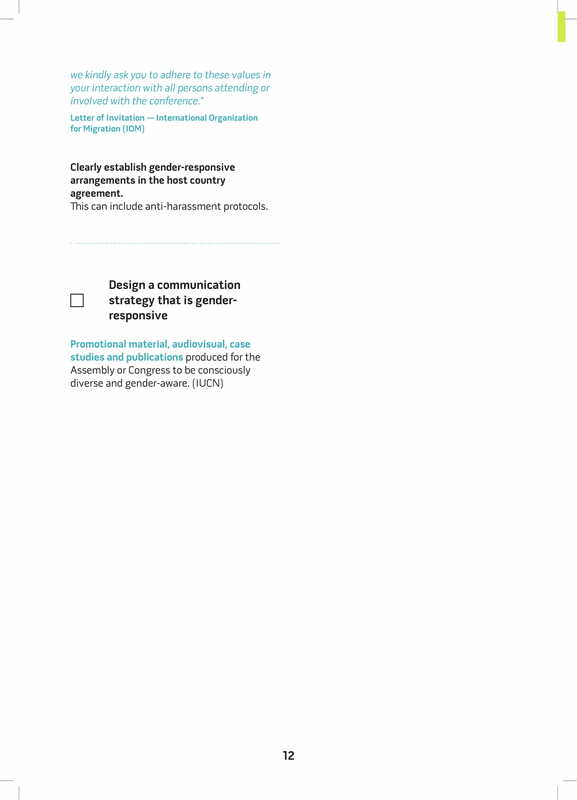 We would like to hear from you, and your ideas and practices implementing gender-responsiveness, or even obstacles you may encounter along the way. 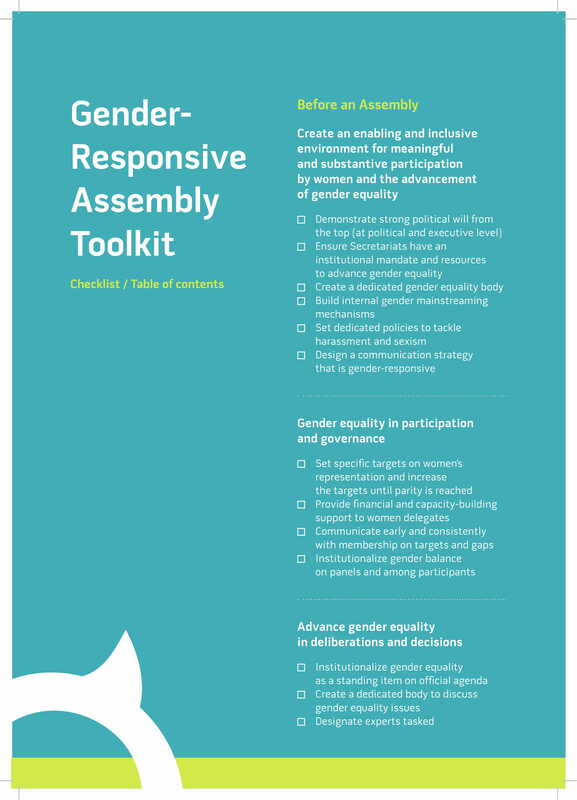 A Gender Responsive Assemblies Toolkit will be shared in September. 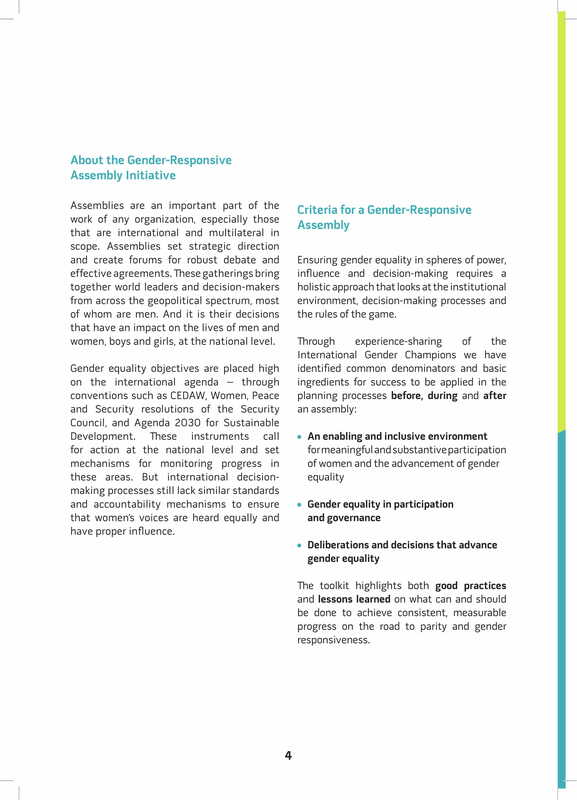 Launched on the sidelines of UNGA, September 28, with a panel featuring International Gender Champions titled "Gender Responsive Assemblies- A Concrete Plan for Action". Without the equal participation of women in decision-making at all levels, peace, development, human rights and justice cannot be achieved. Yet women remain underrepresented in all areas, and by June 2017 they made up only 23.3 per cent of national parliamentarians, 7.2 per cent of Heads of State and 5.7 per cent of Heads of Government. 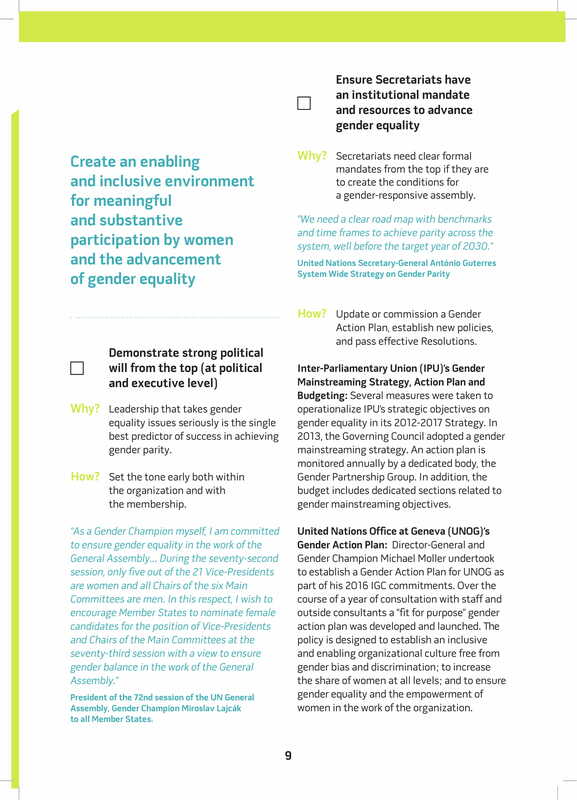 By January 2018, only 26 per cent of permanent representatives accredited to the United Nations in Geneva and in Vienna and 21 per cent of those accredited in New York were women. The 2017 Representation Impact Group, co-chaired by the Permanent Representative of Sweden, Veronika Bard, the Permanent Representative of Afghanistan, Suraya Dalil, and the Director-General of the International Labour Organization, Guy Ryder, convened discussions on topics such as gender balance among members of treaty bodies and special procedure mandate holders as well as women’s representation in international forums. At an event that the group organized during a session of the Human Rights Council, ambassadors and heads of international organizations took part as equals in a dialogue with young women. 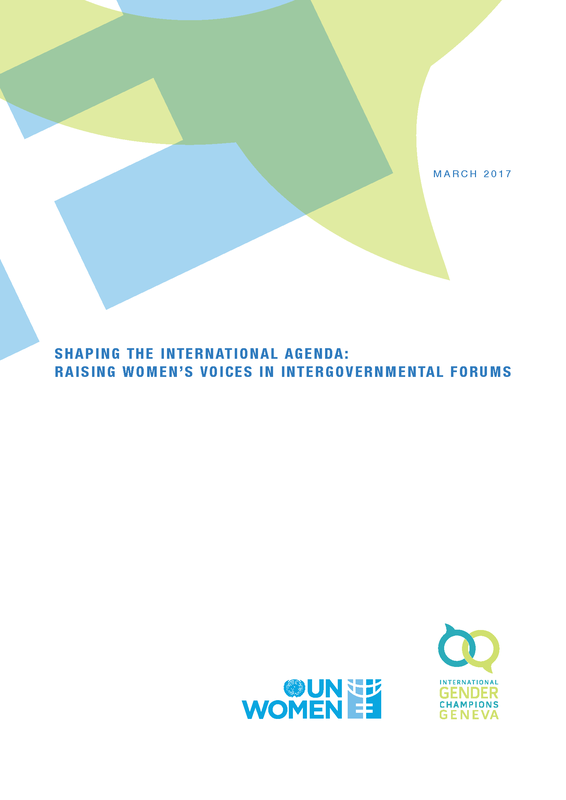 In March 2017, the first publication of the International Gender Champions, Shaping the International Agenda: Raising Women’s Voices in Intergovernmental Forums, was issued jointly with UN-Women. 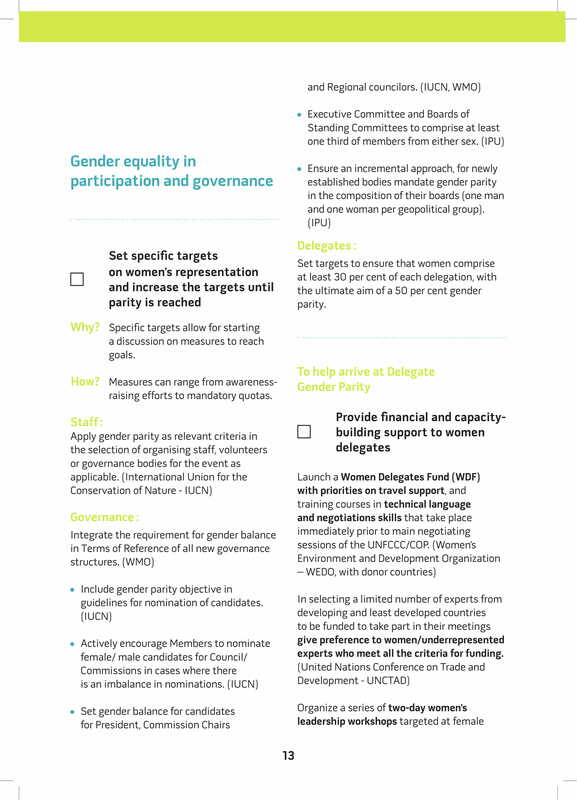 The publication showcases best practices to improve women’s participation and leadership roles at the national and multilateral levels, and identifies concrete actions to improve their meaningful participation in the governing bodies of international organizations. 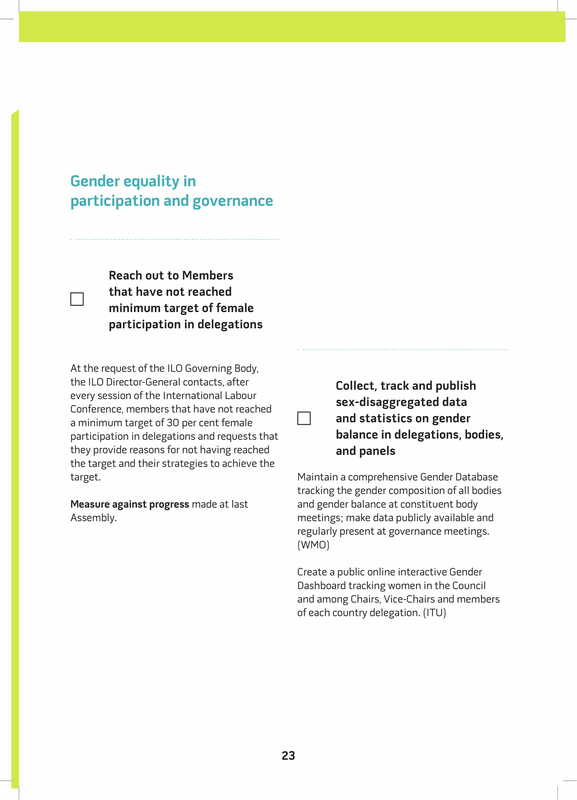 The findings have been leveraged to encourage Governments to send more gender-balanced delegations and organizations to collect and disseminate disaggregated data on the composition of delegations. 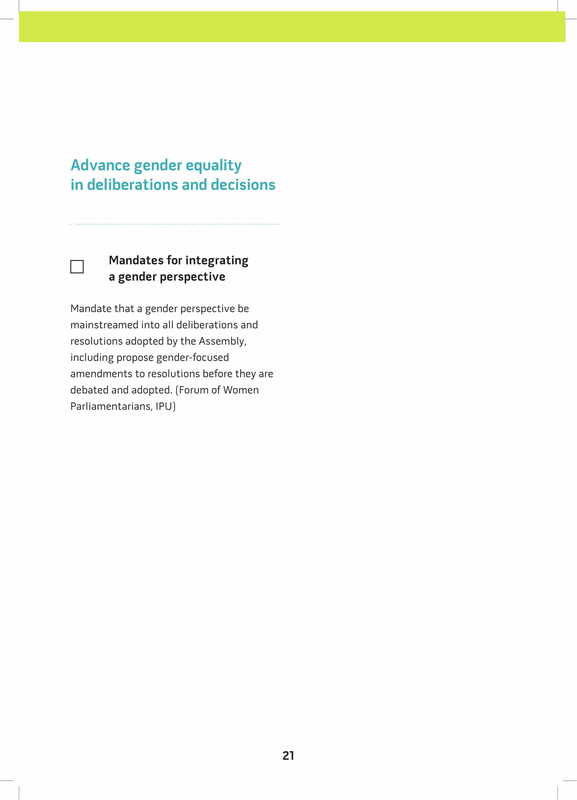 In June 2017, for the first time, the President of the Human Rights Council requested Member States to reconsider the list of candidates for appointment as special procedure mandate holders because it included too few women. 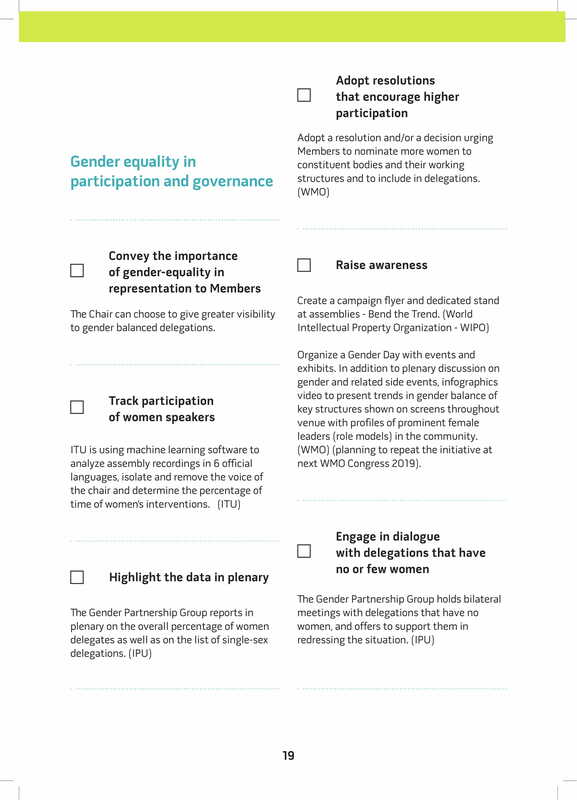 30 per cent of Champions responding to the survey agreed that the International Gender Champions initiative had helped improve the gender balance of delegations and 55 per cent stated that it had resulted in more frequent references to gender equality in United Nations resolutions, outcome documents and multilateral negotiations. 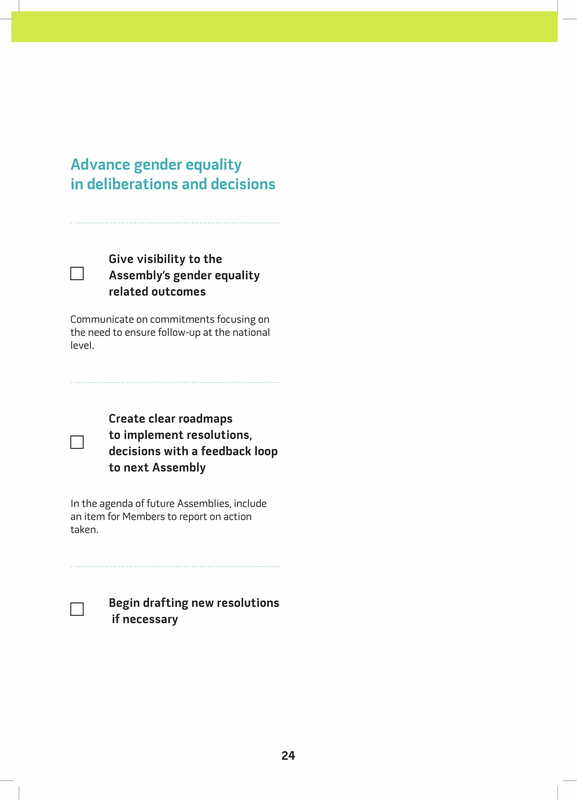 a round table with Gender Champions, streamed live, on the role that male Champions can play in actively promoting women’s political participation and leadership. 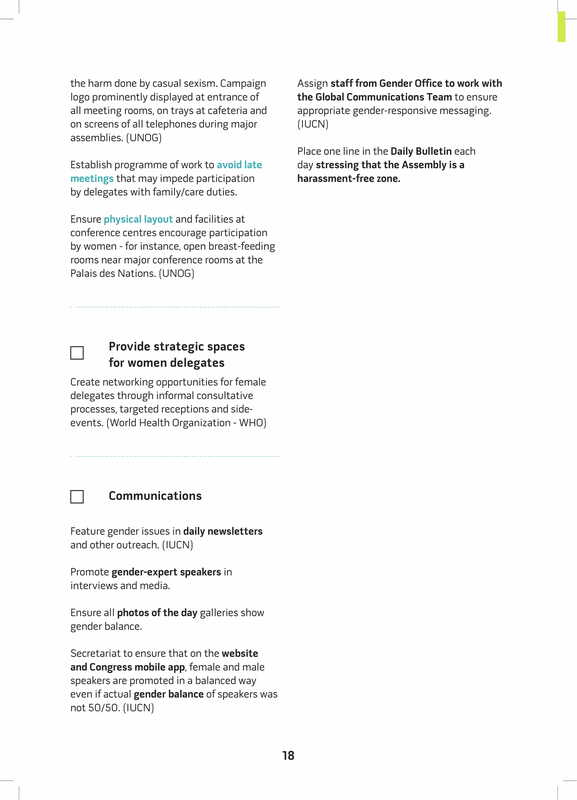 “Turning promises into action: Gender equality in the 2030 Agenda for Sustainable Development”, UN Women’s new flagship report, provides a comprehensive and authoritative assessment of progress, gaps and challenges in the implementation of the Sustainable Development Goals (SDGs) from a gender perspective. Read the summary. 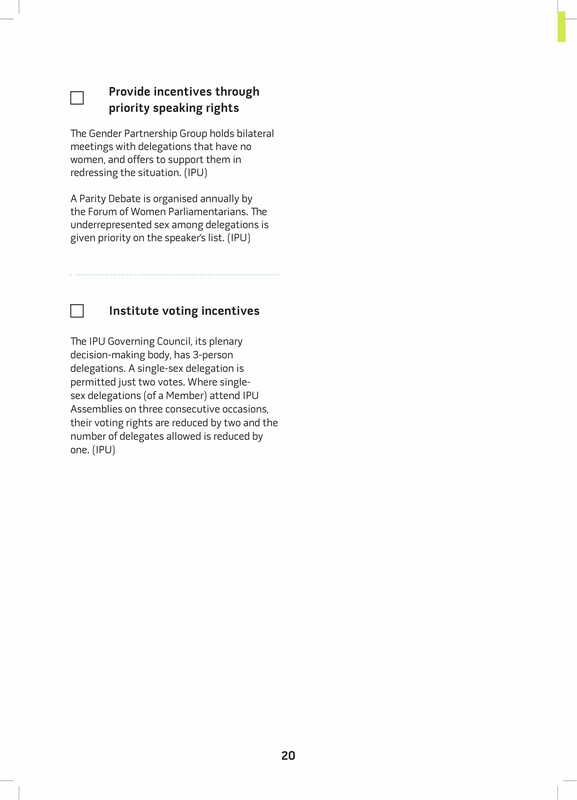 Une liste de vérifications pour s'assurer qu'une Assemblée prenne en compte l'égalité des sexes. This working paper identifies and analyzes complementary international human rights law standards pertinent to the GQUAL Declaration found in the UN Charter, selected international human rights treaties, UN resolutions, and policy statements.